This post contains spoilers for the end of Spider-Man: Into the Spider-Verse. One of the many treats of Spider-Man: Into the Spider-Verse is how dense it is. Every frame is packed with little visual delights; the voice cast is stacked through and through. If you look away for a second, you might miss the Chance the Rapper poster in our hero's dorm. If you stop listening carefully you might not notice that Chris Pine is making a cameo. Hell, a Brooklyn bystander is played by Grammy Album of the Year nominee Post Malone. And all of that is set against pulsating colors that emphasize the artistry in comic books. It's the modern superhero movie that's most indebted to what came before it, while still being one of the most innovative we've seen. And that's why it feels so ripe to produce years and years of entertaining offshoots. It goes without saying that the most important thing Spider-Verse does is establish Miles Morales (Shameik Moore) as a major protagonist. While Spider-People abound -- more on that later -- Miles, a Brooklyn high schooler, is the center of the story, and his is a journey that fans have been wanting, eager for a Spider-Man that's not the same white guy from Queens. Frustrated with his cop dad (Brian Tyree Henry) and his boarding school, he turns to his cool Uncle Aaron (Mahershala Ali), who takes him to tag an underground spot where he, surprise, gets bitten by a radioactive spider. 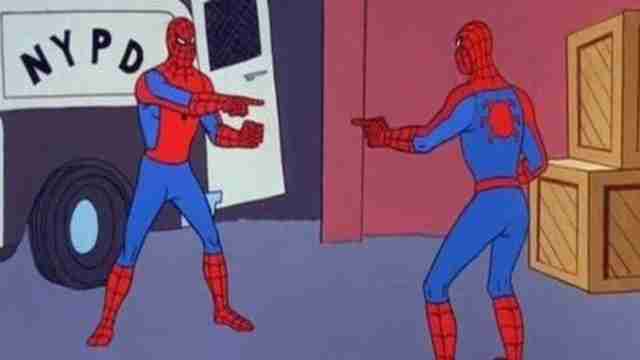 As he grapples with his newfound powers, he accidentally sees Kingpin (Liev Schreiber) kill the reigning Spider-Man, Peter Parker (voiced, in a surprise turn, by Pine), in the process of opening up a portal to another universe. Kingpin is on a mission to save his wife and daughter, who were killed in his own timeline during a confrontation with the webslinger, but in doing so, he sends a host of other Spider-People from various other timelines to Miles' New York. Thus, in order to stop the threat, Miles must team up with an alt-universe Peter Parker (Jake Johnson), who has become depressed and schlubby; Gwen Stacy-turned-superhero Spider-Gwen (Hailee Steinfeld); anime-indebted Peni Parker (Kimiko Glenn) and her mecha; the hardboiled Spider-Man Noir (Nic Cage) from the 1930s; and the cartoon pig Spider-Ham (John Mulaney). If the other members of the Spider-Team stay behind in Miles' world, it's a suicide mission, so Miles must grow into the responsibility of wielding his new abilities. Great power, etc. Spider-Verse is a pop art marvel laden with jokes, courtesy of a screenplay from Phil Lord and Rodney Rothman. It's both self-referential -- at one point ragging on the notorious finger guns scene from Sam Raimi's Spider-Man 3 -- and hyper-literate about the world at large. (See: A crack about Banksy.) And the vocal work is inspired to the point where you long for each character to have more to do. Kathryn Hahn is a manic, sultry hoot as a female Doc Ock, while Nicolas Cage's take on a Philip Marlowe-esque Spidey is genuinely inspired. But the movie has a deep undercurrent of sadness running through it. What bonds all the heroes -- and even the main villain -- is a sense of loss. Spider-Verse understands that regret has always been the most potent element of the Spider-mythology. For Miles that comes at the expense of his Uncle Aaron, but everyone has their version of that. All the action takes place as the city mourns the old Peter -- the one that looks most like the Spidey we've come to know through now three reboots. So, by the time Miles repaints his suit and assumes the maturity that the Spider-mantle requires, it feels like a true triumph. Unlike most Spider-Man origin stories, it takes him the whole running time to get to this point, but that means we're all the more ready to root for him for years to come -- and that's huge. Throughout the movie, the Spider-People narrate their origin stories, different spins on the one we've heard so many times. As the action drives to a close, Miles finally gets to do the telling. The post-credits tag pushes the property even further, with that spirit of playfulness in tow. It opens with the card: "Meanwhile in Nueva York." And voila, there's yet another Spider-Person with a very familiar sounding voice. That voice is indeed that of Poe Dameron himself, Oscar Isaac, and fans will identify him as Spider-Man 2099, a.k.a. Miguel O'Hara. He's joined by his hologram assistant Lyla (High Maintenance star Greta Lee), and with her help, he makes a multiverse jump that plops him down in Earth-67, where he encounters another Spider-Man and they point at each other for a very long time. This is all a reference to the popular meme of two Spider-Men pointing at each other, which in turn comes from an episode of the 1967 Spider-Man TV series. It's a funny gag, but Miguel has a connection to Miles: He too was groundbreaking, the first Latino Spider-Man upon his debut in 1992. Perhaps there will be more Miguel as the Spider-Verse bounds forward. Or maybe not. This film nods to the Spider-obsessives but also to the commonality that all these heroes share despite coming from literally different dimensions. This suited crusader has always made for compelling and successful film adaptations because of both humor and pathos. It's all here in spades, it's just bigger and bolder than ever before.